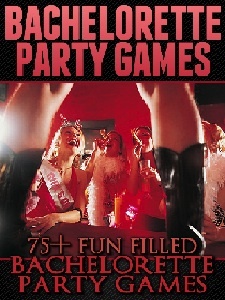 The Bachelorette Party Games book includes an extensive collection of new and updated bachelorette games guaranteeing a fabulous, unforgettable bachelorette party. Including three sections, bachelorette home party games, party games for out on the town or bachelorette drinking party games. So no matter if you are planning a quiet night in with friends or a wild night out on the town we have a game for your bachelorette party.